Posted on Thu, Dec 17, 2009 : 10:02 a.m.
Lots of people talk about Christmas, but few ever do anything about it. Until now, that is. 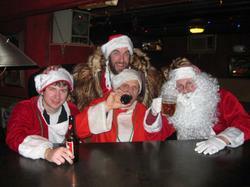 This Saturday, Dec. 19, at least several dozen Santa-clad folks from Ann Arbor will step up—onto a bus bound for downtown Detroit to join hundreds of other Santa Clauses for the 2009 edition of Santarchy, a holiday pub crawl for those who are (or soon will be) full of Christmas beer cheer. 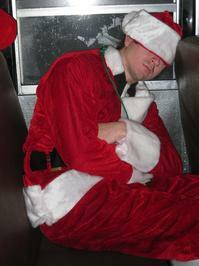 Last year (or maybe the year before that; the memory fails), the jolly folks organizing Detroit Santarchy began sending a bus out to Ann Arbor to give Tree Town Santas a way to participate without suffering guilt pangs over driving individually and increasing their evil carbon footprint. Or something. If the third thing, by all means come to the 8 Ball Saloon, 208 S. First, at 6:30pm on Saturday in appropriate attire and with a $20 bill (to cover your evening’s bus privileges) and become part of what makes America great. You probably don’t want to invest too much in your Santa (or Mrs. Claus or elf or reindeer) suit. Your individual good taste, no matter how impeccable, cannot possibly class this event up, and you’ll just be upset when you feel the need to find a way to clean the spilled beer, cigarette smoke, dirty snow, and dried vomit off your expensive, delicate costume without destroying it in the process. Remember: Less is more! You may want to bring some beer with you for the bus ride. It’s 45 minutes or so to downtown Detroit. And when I say beer, I mean cheap, low-alcohol swill. Do not under any circumstances bring whiskey or other high-octane beverages to consume on the bus ride. This is a marathon, not a sprint, rookie. So to recap: Saturday. You. Santa suit. 8 Ball. 6:30. $20. Six-pack of PBR. See you there. If you’re Santa enough. David Bardallis is a freelance writer and editor, blogger, bon vivant, and man about town. Visit his Web site, DavidBardallis.com, to engage his services or read his latest. Email your beer-related thoughts to annarborbeer@gmail.com or follow @dbardallis on Twitter. Fri, Dec 18, 2009 : 1:14 p.m.
Fri, Dec 18, 2009 : 7:29 a.m. I've had my share of similar events (Read, "I'm now over it."). Years ago, through a Detroit brewery, co-workers who regularly played basketball, arranged a bus tour of the brewery, tickets to a Pistons game and a round trip bus ride. I wonder if we scared anyone with our drunken behavior through the night. I felt scared when the green bus with "Shillelagh" emblazoned on the side stopped in front of my house at 2 am last weekend. Yelling drunks wandered across my lawn, up my driveway, and into the 2 houses next to mine. The bus was parked there for the better part of an hour while Santa-hatted drinkers littered, yelled, wandered, and left plenty to clean up behind. Of course the "Shillelagh" bus owner is making some money on their concept/scheme. I wonder if they'd add some responsible "cat herders" to reduce the negative impact upon drop-off. Thu, Dec 17, 2009 : 1:50 p.m. I wish I could go. This sounds like a great time.